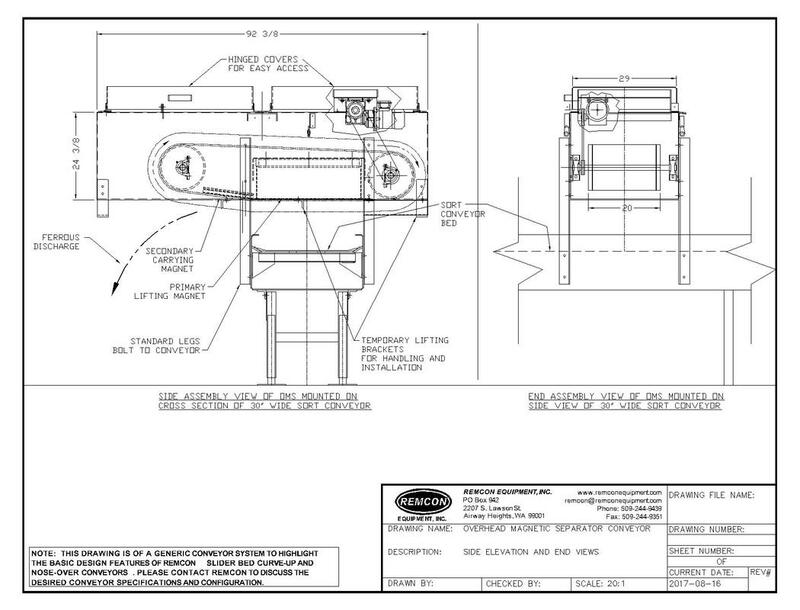 Overhead Magnetic Separators - Remcon Equipment, Inc. - Remcon Equipment, Inc. The 3-ply belt is equipped with 3 inch high cleats 18 inches apart and is coupled by stainless steel lacing. This combination results in a high strength belt with a 330 Ib. per inch width tensile strength rating. Remcon OMS Units can be ordered to mount above a conveyor in two different orientations. In a crossbelt orientation, the OMS belt runs perpendicular to the conveyor below, transferring ferrous material to one side of the conveyor. In a parallel configuration, the OMS unit is mounted above the discharge end of the conveyor below, with the belts running parellel. The ferrous material is lifted from the lower conveyor and thrown beyond the non-ferrous material trajectory. All units are constructed of 3/16 inch steel plate. Typical dimensions are 96 inches long by 42 inches wide by 30 inches high. Dimensions may vary per specific applications. OMS Series units are equipped with 3/4 HP, totally enclosed, fan cooled motors. Coupled by a V-Belt drive to reduce shock loads and jamming hazards, the Dodge gear reducer is 100% sealed eliminating the possibility of oil contamination. The plate magnet produces both primary and secondary magnetic fields with an effective reach of 12 inches. 12 inch diameter crowned pulleys keep belt tracking true, minimizing time consuming adjustments. All bearings are self-aligning, pillow-block style, sealed units requiring grease only bi-annually. The Remcon cross belt magnetic separator is completely enclosed with a hinged housing design. Belt edges, pinch points and all hazardous drive components have all been covered to maximize safety.